Steve Carell and Kristen Wigg lend their voices to the lead characters Gru and Lucy in the sequel to the 2010 Animated Fare Despicable Me. Directing duo Pierre Coffin and Cinco Paul return to tell the story of the now domesticated super villain Gru who once stole the moon. 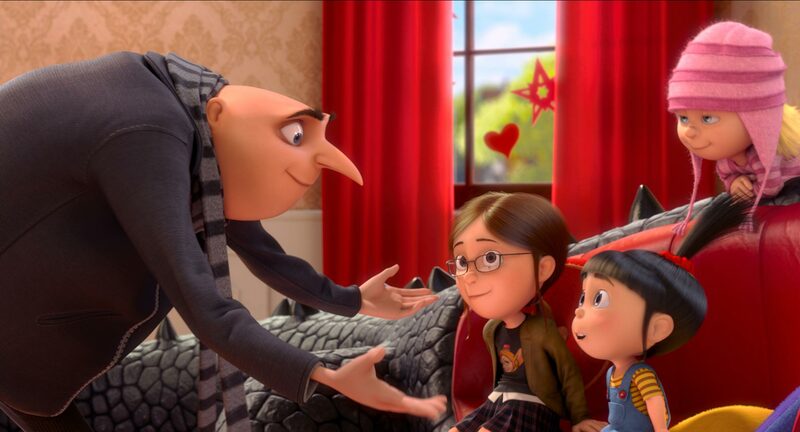 The story sees Gru as the single father of 3 girls trying to play fairy godmother at a birthday party while trying to keep the nosy match-making neighbor at bay. After retiring from Super Villainy Gru and his adorable yellow minions have now setup a jam and jelly factory with Dr. Nefario – voiced by Russell Brand leading the production line. Dr Nefario tired of not doing evil quits and moves to another job and Gru is approached by AVL – Anti Villain League to identify and apprehend a master criminal who has stolen a secret formula which turns cute fluffy bunnies into giant purple monsters. Gru is assisted by the AVL’s own agent Lucy voiced by the multi-talented Kristen Wigg (SNL, Bridesmaid). There has long been a Pixar vs. RestOfEmStudios debate that almost always results in the same outcome of the fact that Pixar movies have more heart and are in general better written , directed thought out movies than Others which rely too heavily on pop-culture gags which will lose relevance over time and not be as funny. Unless Pixar has a top-secret project coming out this year which no one knows of I think this year Pixar has been outdone whose latest Monster’s university was a bit of a bum note as compared to Despicable Me 2 which is genuinely funny and has plenty of heart to spare in the form of the 3 adorable daughters Margo, Edith and Agnes. The story seems rushed in parts where they clearly are targeting 3 suspects and somehow they end up ignoring the third one completely by focusing on Floyd and Eduardo. The justification of why Gru wants Eduardo and his son arrested is done in the funniest way possible. Another thing which I did not get is the effect of the secret serum turns a bunny into a possibly-6ft tall monster but when applied to “others” it merely turns them purple with Diana Ross hair. I laughed out loud several times and considering that the audiences did too at the same jokes validates the universality of the humor at play. Gru and the 3 girls are fantastic and so is Lucy, but the movie clearly belongs to the Minions and I cannot wait to watch an entire movie dedicated to the Minions which is slated to hit the screens in 2014. The last scene of the Minions singing is just priceless. Watch this movie because everyone needs a good belly laugh every once in a while and this one does so by invoking fart gags only twice and that too quite effectively and it rather relies on cleverly written humor and one hell of a side-kick legion of the minions who are just insanely funny.